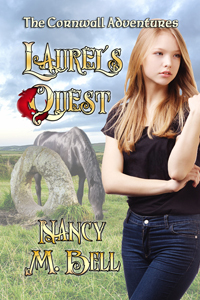 Laurel's Quest by Nancy M Bell click here to find out more about this and other books in the series. 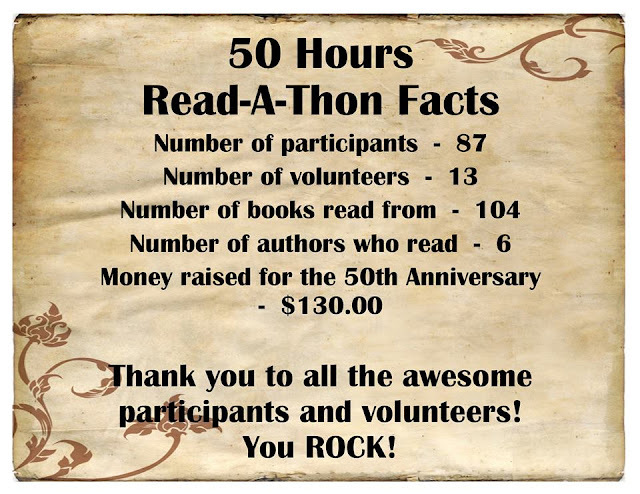 So, you're asking, what the heck is a 50 Hour Readathon and how is that even possible. Well, let me tell you! The Morinville Community Library in Morinville, Alberta is celebrating its 50th anniversary. The library staff came up with a magnificent idea. Why not hold a readathon that lasts for 50 hours? One hour for each year the library has been open. The plan came to fruition on the weekend of June 2nd to 4th. 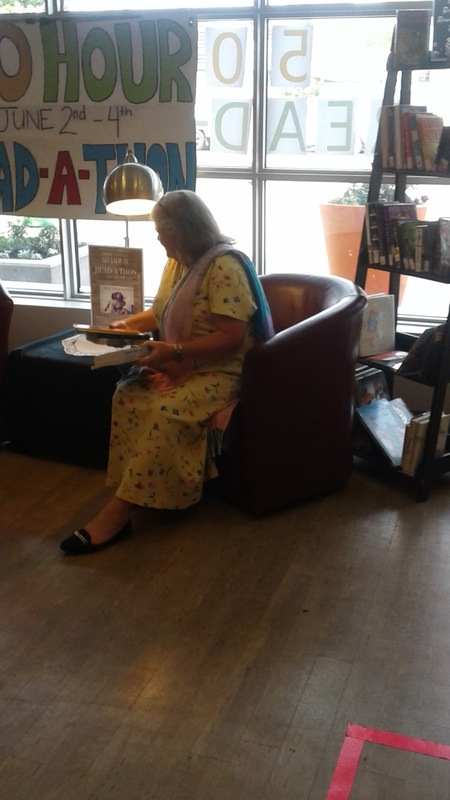 Of course, no one person was expected to read aloud for the whole time. 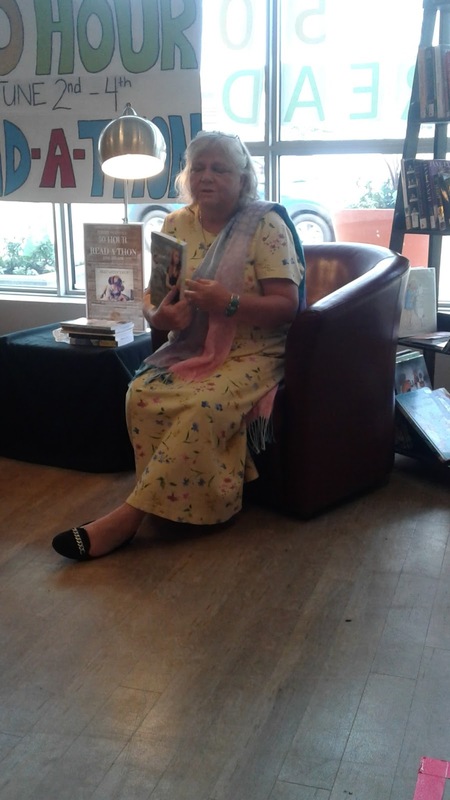 The word went out and authors and readers from all over Alberta came out to participate. I was lucky enough to be able to take part in this great event. My designated time was between 1 and 2 on Saturday afternoon. I drove the 3 hours from Balzac on a beautiful sunny afternoon. The library staff was very welcoming and local sponsor Panago Pizza provided some lunch, and there was CAKE! I mean who can resist cake? But I digress, sorry. Back to the readathon. I read some chapters from my YA urban fantasy Laurel's Quest which is the first book in the Cornwall Adventures series. I couldn't believe how fast the time went! I had brought a few of my other titles with me because I wasn't sure how much I needed to fill an hour. I shouldn't have worried, I got through 2 chapters and then it was time for the next reader. I even got streamed live on their Facebook page! Can you imagine? That's a first for me. You can see the video here. Dedicated participants came all through the night, some even reading in their pyjamas. Every genre under the sun was included, poetry, plays, some people read in French, non fiction, children's books, picture books...there was something for everyone. Morinville is a lovely town just north of Spruce Grove, Alberta which is kissing cousins with Edmonton. If you ever have the opportunity to be up that way, be sure to drop in and visit. Please check out what they have to offer by clicking here. It was a wonderful weekend and it was a pleasure to take part. I even got to be in the Morinville News! I'm on page 14. Here are some stats from the weekend. Pretty impressive, I must say. I'll leave you with a few more pictures of the event. I've included a bit of Laurel's Quest that I read at the Readathon below. This is from Chapter Two, Laurel has made it to Sarie's in Cornwall and she has run away into a small ravine on the property. There's a hidden spring and Laurel is sitting by the edge. She's mad her dad won't let her come home and she's scared for her mom. This is where she meets the White Lady and where her quest begins. How am I going to manage without my mom to talk to? She scrunched her hands into fists and pounded on her thighs in frustration. The floodgates burst open. Sobs tore her throat, and tears clogged her nose, her ribs hurt, and she still couldn’t make herself stop. It just wasn’t fair! Without realizing she had moved, Laurel found herself lying face down on the flat stone with her legs entangled in the bushes. Her tears fell into the pool, making little circular ripples like raindrops. It was a little easier to breathe now, but the tears kept coming. Laurel cried for her Mom, for Cole, for Sam, and mostly for herself. She was abandoned half way across the world. Mom needs me; I need Mom; I want to go home! The tears dripped off her nose into the pool, faster and faster. She needed to stop crying, but she couldn’t. The loss of control scared her, and she was very cold now. Her feet felt like ice, her wet jeans clung to her cold legs. In between the sobs, Laurel’s teeth started to chatter. The woman about her mom’s age, but it wasn’t her. The lady had blue eyes, and her skin glowed. Bright and silvery blond hair hung long and gossamer around her face, falling over the weird hooded robe she wore. The fingers on her hands were short and sturdy. She was the most beautiful person Laurel had ever seen, except of course for Mom. “No, sweet child, I’m not the mother you are missing so badly.” Her voice blended with the sparkling voice of the spring. The woman sat down and rested a hand on her cold shoulder. The touch was comforting. Laurel wriggled around and sat cross-legged with her knees drawn up to her chest. She wrapped her arms around them in an attempt to stop the shivers. The woman wrapped her cape around Laurel. She gathered the soft fabric up under her chin, breathing in the sweet scent of verbena and lavender. Immediately, she was warmer and calmer. With her eyes on the fall of the water into the little rock pool, she searched for something to say, embarrassed at being discovered wailing away like a baby. Even worse, by someone she didn’t even know. “In a manner of speaking, I do. I can usually be found somewhere near this spring,” the woman answered. “Do you know Sarie?” They must be friends, if this woman hung out in Sarie’s pony field. “Some call it the Well of the White Lady,” the woman said softly. “She is the spirit of this place, this spring. But she is connected to all the sacred wells and springs, indeed to all the landscape that is Britain,” the woman explained. “So she’s like an undine?” She remembered her mom’s story about the water spirits. “Undines are water elementals. They dwell in any body of water and are small and childlike, although they can be quite helpful at times. The White Lady is the actual spirit of the spring, associated with a particular spring. She is however connected to the greater feminine spirit which inhabits all the sacred springs and dwells in the landscape about us. The greater Spirit is known by many names Mary, Brigit, the Lady of the Lake, and in other lands as Isis, to name just a few.” The woman’s voice held a strange vibrancy. “Are you the White Lady?” Laurel’s voice was very small. She was pretty sure she already knew the answer. The woman didn’t answer immediately. Stray beams of sunlight flickered in her bright blond hair; a halo of golden light surrounded her. Fear blossomed in the pit of Laurel’s stomach. Maybe Mom’s stories are real. Maybe magic does exist in today’s world like Mom insists. “A favor?” She hadn’t come to the spring to ask for anything. She only wanted to be alone. “Most of those who come here come to ask for something, a lover, a husband, a child, or to bend others to their will.” The White Lady smiled as she spoke. Do I dare ask? What will it cost me to have my wish granted? In all the fairy tales, there was always a price to be paid for favors given, usually a pretty high one. Still, I don’t care what the cost is as long as my wish comes true. “I want my mom to get better. She has cancer, and she’s really sick. She can’t die. I need her. That’s what I want, my mom to be healthy again,” Laurel said quickly, before she lost her courage. Holding her breath, Laurel clenched her hands together so hard her nails bit into her palms. Please say you’ll help me. The White Lady’s face was serene, but her eyes were unfocused as she looked at something far away. Presently the White Lady smiled. “Mom will be okay if I solve this riddle?” She wanted to be very certain she understood what the White Lady offered. Friends, I don’t have any friends here. Who can I ask to help me? The only person she knew was Coll, and Sarie, of course. I can’t ask Sarie; maybe Coll will help me. He seemed pretty nice on the train last night. “Do you agree to accept the terms of the bargain?” the White Lady prompted Laurel. “It will be so. Remember your time to complete the tasks is limited by your mother’s condition,” the White Lady affirmed. The White Lady placed her hand on Laurel’s head and smiled. “Then let it be so recorded,” the Lady said simply. “When do I get the first part of the riddle?” In her mind’s eye, she saw sands draining through an hourglass, like on the soap opera her mom liked to watch. The White Lady shimmered in a shaft of sunlight which found its way through the leaves. Laurel blinked in the sudden brilliance. When she looked again, the Lady was gone. A soft breeze touched her hair, and then all was still in the little glade, the water continuing to fall into the pool. She climbed up the steep side of the ravine above the spring and emerged in the pony field not far from the house. The four ponies came trotting over to see if there were any goodies to be had. The heavy horses thundered up behind them. Laughing, she patted each one in turn, letting them sniff her hands. Laurel started toward the gate, her sneakers making wet sucking noises as she walked. The herd followed her single file all the way to the gate.